I love my YA reads and this one captured my attention purely on the synopsis alone. This is a book that you need to go into blind and as such this review will be vague and spoiler free, but if like me you love a good YA, then this is a must read. From start to finish I was totally gripped by our brave girl, Flora Banks and with elements of mystery and suspense thrown in this book will appeal to a variety of readers not only YA or contemporary readers. 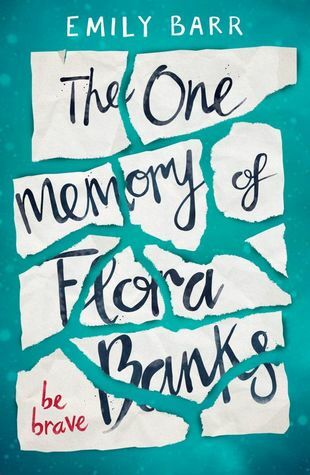 Flora Banks is a seventeen-year-old girl who suffers from Anterograde Amnesia. This means that Flora cannot retain current memories, she can remember for a few hours and then after that it is a blank once again. The only memories she has are that from before her operation, her ten-year-old self and younger. To lessen her confusion and panic Flora is constantly writing notes, leaving messages for herself on her hands and arms and journals everything, so that once she reads, she can calm herself once again. I cannot imagine how hard it must be for Flora. Emily Barr is a master storyteller and the way in which she delivered Flora’s story was truly commanding. Flora is not a reliable narrator and as such this book reads like you a suffering amnesia along with Flora too. Emily Barr really transports you into Flora’s world and at times, you are just as confused as she is, but, and this a huge but, it really works. It is this style of writing that really cements your character connection with Flora, she is a character that is totally lovable and as you live her confusing life you just want to jump within the pages and be her guide. Yes, it can be repetitious, but that is Flora’s life, repetition is the only way that Flora knows. Flora was adorable and sweet, she is brave and courageous, she wants her independence, she wants to grow up. Her parents mollycoddle her and have her wrapped up in this protective cocoon, keeping her life firmly planted in the year she turned ten years old. Familiarity is the name of the game, but the same routine, the same life, just everything the same becomes monotonous, even for Flora. Flora is not ten years old, she is seventeen and as such she wants to expand, she wants to spread her wings, but they have been clipped. This book is a journey for Flora, not only for her future, but her past too. Flora wants to live for the now and when one particular memory refuses to budge, Flora thinks she has hit a milestone, but it is this one and only memory that she remembers. When the subject of that memory moves to the Arctic, Flora follows and so the journey of a life time begins. You cannot help but empathise with Flora and as she embarks on this testing journey you are with her one hundred and ten percent, willing her on, trying to telepathically send her memories though the pages when life becomes a little hazy. Flora is a heroine you cannot help but take into your heart, she is your little sister, your friend and you cannot help but want to help her. My only niggle with this book…I wanted more. I did feel the very ending was a little rushed and I still have a few questions, I want to know what happens going forward…desperately. The run up to the end though was a great twist and one that was seamless in its delivery. I was pleased that this was not a “miraculous recovery book,” love is extremely powerful but even love has its restrictions. This is definitely a book that had my mouth dropping at times as well as a few stray and errant tears, but most of all, this book gives you a life lesson too. Seize the day, carpe diem, you may wake up tomorrow and never remember a thing. Amazing book, adored it.